Pokémon may be marketed toward younger fans, but the most well-known competitors are adults. This year, however, the most impressive performance belongs to Nicholas Kan, an 11-year-old from Australia who makes Ash Ketchum look bad. Kan plays in the Junior Division, which encompasses competitors born in 2006 or later. He won the World Championships in his division this year, but he also nearly swept all four of the season’s International Championships. After falling just short of winning in London, Kan defended his home turf in Melbourne, found repeated success in Sao Paolo and nailed the hat trick in Indianapolis. And just to add a cherry on top, he won one of the few regional tournaments in his area (beating the Masters division world championship runner-up in the process). That level of success is unheard of in the Video Game Championship series, at least in a single season. The scene has a three-time world champion and a handful of players with some tournament wins, but that’s spread over an entire career. Kan won almost as many tournaments in 2017 as some players have ever won, period. His win at the World Championships is a good example of why he was so dominant this year. Spain’s Tomás Serrano Carratalá looked threatening with his unique take on a Trick Room team. By using Oranguru to reverse the turn order, and then letting its partner attack twice with Instruct, Carratalá overwhelmed his opponents before they ever got a chance to figure out how to stop the onslaught. Kan, however was prepared. “Because I had Snorlax, I could take advantage of my opponent setting up Trick Room,” Kan said. It was more than just having Snorlax, though. 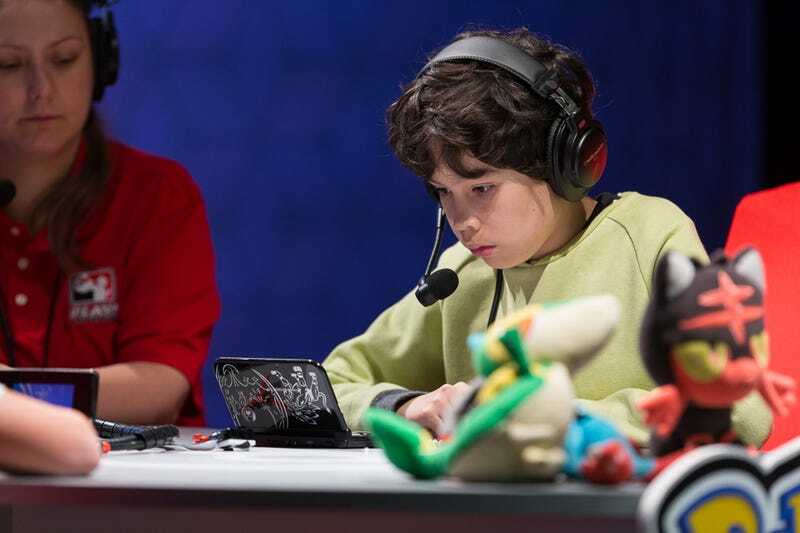 The sleeping Pokémon was everywhere this season, and Carratalá must have overcome plenty on his march to the finals. Many younger players might be tempted to lean on Snorlax too early in matches, and find it KO’ed before they can win. Kan, on the other hand, preserved his win condition until the end. Not only did he remove Snorlax’s biggest threat, the fighting type Hariyama, with a Z-move from his Gyarados, but he was willing to sacrifice half of his team to keep it safe. Then, in game two, Kan showed his predictive capabilities, planning multiple turns ahead to find an advantage. To start, he lead with Gyarados to weaken the opposing Haryiama’s attack stat with the Intimidate ability. He then anticipated the Fake Out onto that slot and switched in his Garchomp, which dealt a bit of recoil damage with the Rough Skin ability. Meanwhile he knew his Snorlax would get Taunted by Oranguru. On turn two, that provided him the perfect opportunity to switch it out for Gyarados, get a second Intimidate and allow Garchomp to Earthquake freely. But most importantly, it allowed him to eat a powerful All Out Pummeling that would have been super effective on Snorlax. As a flying type, Gyarados resisted it with ease. By playing so well, so early, it was only a matter of time before Kan cemented his place as a world champion and a legend of the Juniors division. It wasn’t always that easy for Kan, though. In fact, he came close to being knocked out of the tournament multiple times at the Indianapolis North American International Championships. After dropping two games during the first phase of the tournament, he had to win out to make it to the second day of competition. And focus he did. His first game was a slow but steady victory for him, but a critical hit in game two threw him for a loop and forced game three. Once again, whereas many players might get tilted from the bad luck and make mistakes with the set on the line, Kan kept his cool. As it turns out, Kan isn’t the only world champion in his family. His older brother, Chris, managed to win the 2011 world championship in the Trading Card Game’s middle, Seniors Division. The TCG is also where Nicholas got his start, but both brothers transitioned to VGC in 2013. After making the switch, the two constantly work together to make teams, go over matchups and practice. Obviously it’s paid off for Nicholas, but Chris has proved he’s no slouch at VGC by winning the Masters Division title at the North American World Championships. The team he won with is also identical to the one Nicholas used to win worlds with. Now that his season is over, though, he’s focusing on next year. Since 12 is on the horizon, he’ll have to compete in the Seniors Division for the 2018 season. That means stiffer competition from older players, but his track record should give him confidence going forward. And, at the least, odds are good he’ll always be able to claim the strongest season ever for many years to come.